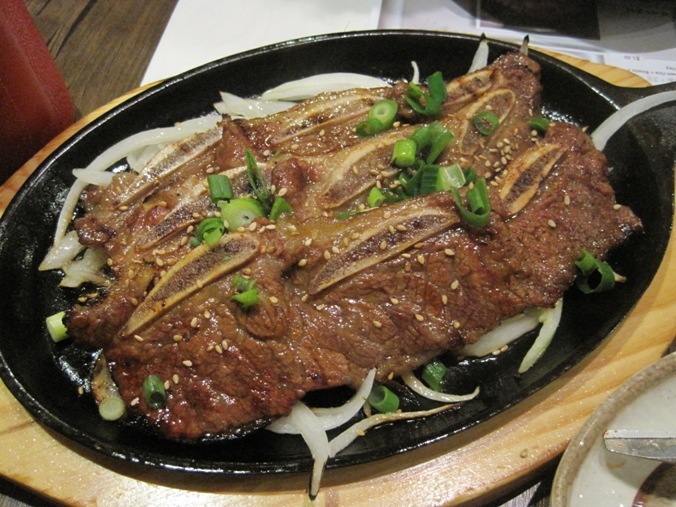 In the past month of so, several people have recommended Song Cook’s to me for Korean food. Finally, one evening Mike and I made our way over. The restaurant location is a little hidden inside a plaza on Steeles (just West of Yonge). Just look for the plaza on the north side of Steeles with the Moores in it. Upon entering the restaurant, a hostess asked us if we wanted to sit on the floor or at the tables. We noticed that half of the restaurant was designed for people who wanted to sit on the floors, while the other half was filled with tables. Since we were tired from a long day of golf, we thought it was best if we just stuck to the tables. Maybe we’ll try the floors next time. I was surprised by how large the restaurant is. It occupies a large space in the plaza and has high, slanted ceilings with beams going across it which kind of reminded me of a ski chalet. From the get-go, I wasn’t too impressed with the service. I noticed there were quite a few people working at the restaurant just standing around. But when it came time to ordering our food, we had the hardest time getting the attention of any of the servers. Couldn’t help but feel a little ignored. 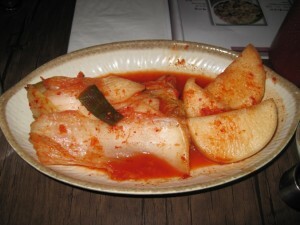 After ordering, we were brought a plate of kimchi and pickled radishes. When I went to pick up a piece of the kimchi, I noticed that it certainly wasn’t bite-sized as the pieces were enormous. I then noticed the pair of scissors they had also brought to us and it suddenly clicked. 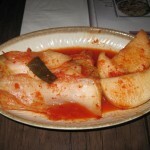 I don’t particularly enjoy kimchi, but I usually still have a small piece of it at Korean restaurants. 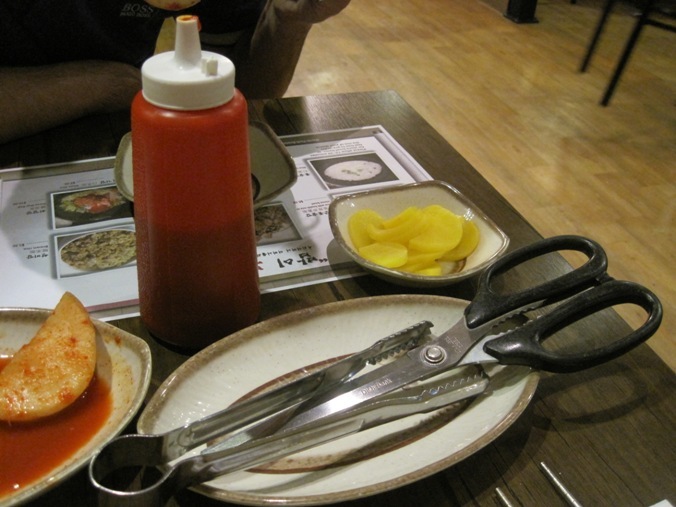 What I really missed at Song Cook’s was the typical banchan (the small dishes served at Korean restaurants as little appetizers) dishes, which is normally my favourite part of going out for Korean food. I loved that the menu had these combos meant for one person, consisting of two different types of dishes. They’re perfect for indecisive people like myself. I went with the Half JaJangMyun + Half Champong – Veggies, beef, black bean sauce on noodles & spicy seafood noodle soup ($8.50). 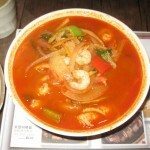 I started with the Champong, which was a very rich and spicy broth filled with bite-sized pieces of seafood. Although I can’t take an incredibly amount of spice, I do enjoy a bit of spice in my food. I found this to be the perfect spice level. 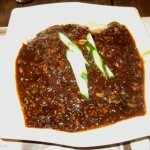 As for the JaJangMyun, I wasn’t quite sure if I really liked it after my first bite. But the more of this I ate, the more I enjoyed it. The noodles contained a generous portion of the thick black bean sauce, which seemed to consist of mainly onions and beef. The sauce actually contained a significant amount of diced onions, so if you’re not a huge fan, I’d think twice about ordering this. As for the noodles, which are house-made, they had a chewy texture and a nice bite to them. Another solid dish. I was surprised by how large both the “half” dishes were, considering it’s a combo meant for just one person. 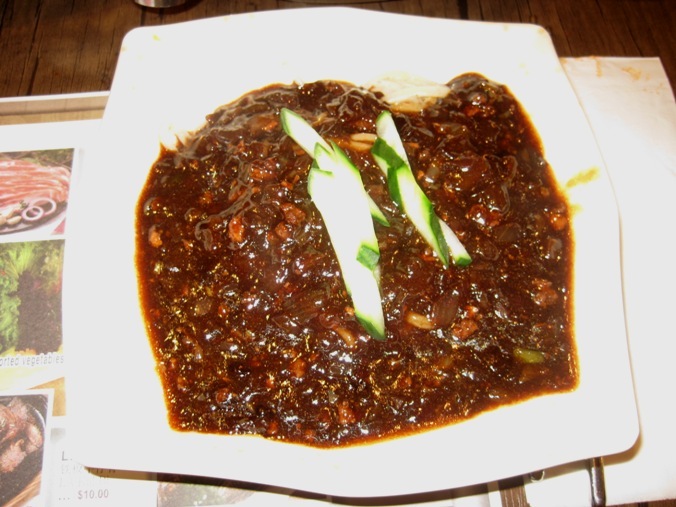 Since I started with the champong, that alone filled me up so I didn’t even come close to finishing the JaJangMyun. Great value for only $8.50! 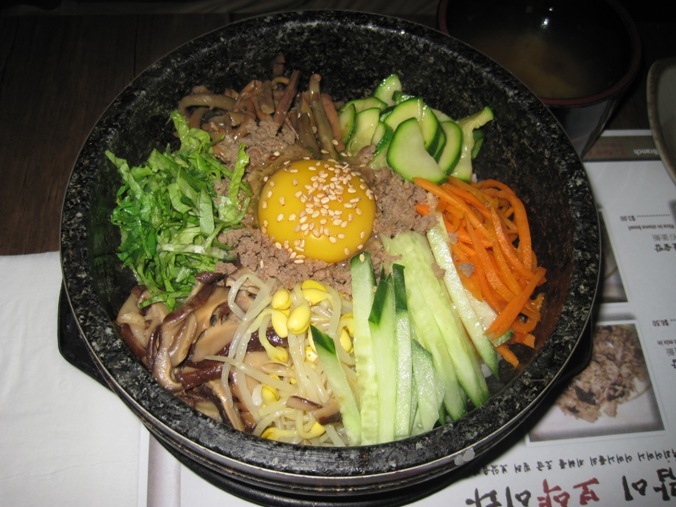 Mike went with the DolSotBiBimBap – veggies, ground beef and egg on rice in a hot stone bowl ($8.50). The dish came with mushrooms, bean sprouts, julienned cucumbers, carrots, lettuce and beef topped with a raw egg. The hot sauce, which came in a bottle on the side, wasn’t too spicy so we put a generous amount of it on the rice. 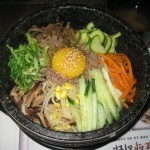 I love bibimbap, and the one at Song Cook’s was no exception. I loved the mixture of the ingredients with the crispy rice. The only complaint Mike had was that there wasn’t very much meat in it. 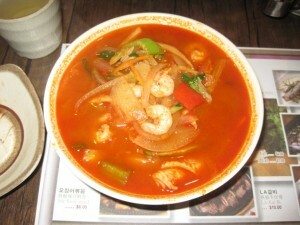 Luckily, we also ordered the LA Kal Bi ($10). It came with three pieces of the short ribs on top of a bed of onions. The meat was marinated perfectly and was incredibly tender, unlike some other restaurants which serve up really chewy ribs. At $10, this dish was a little expensive compared to some of the other dishes we ordered, but it was well worth it. 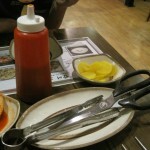 Despite the service, I’d still recommend Song Cook’s. 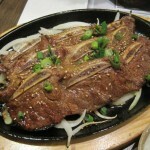 With reasonable prices and delicious food, this is definitely one of my new go-to Korean restaurants. I love the korean cold noodles! I know some places only serve them in the summer… hope they still have them.